Even though I’m a fan, I always have a little trouble pronouncing the “Ferrero” in “Ferrero Rocher”. I don’t know why, it’s not the most complicated name, but I guess growing in the 80’s I think of Geraldine Ferraro and even then, it’s pretty much the same pronunciation but will refer to them as “Ferrer” – I don’t know what my problem is but I mostly just call them”Rocher”. Everyone does, right? 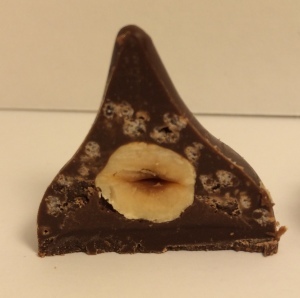 The cross section looks just okay visually. You’ve got your crunchy element, the ganache-esque smidge of a layer and of course the hazelnut in the middle but upon tasting we could tell the Kiss was lacking. While I thought the crunchies were okay, Ethan didn’t even find the detectable. The “ganache” to me was sub-par at best and not much of it. We both found the chocolate to be kind of fake tasting and overly sweet. Ethan’s last note on this was “the nut was okay”. What’s so nice about Rochers is the clearly defined layers that work separately, yet together for a full multi-texture experience. Chopped hazelnut pieces coat a wafer layer which surrounds ganache and in the center is a whole toasted hazelnut. 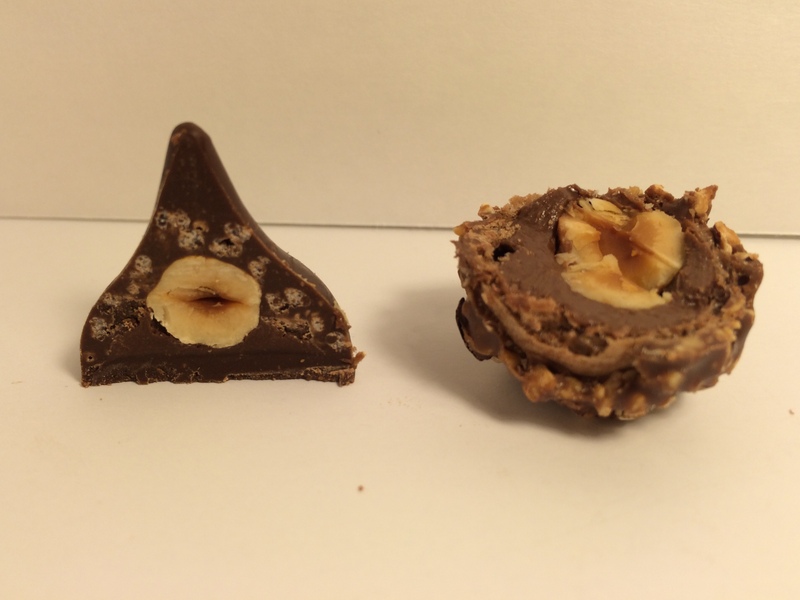 One of the major advantages Rocher has over the Kiss is that wafer later- I don’t know how they do it, and I guess hershey’s doesn’t know either, but it makes such a difference. 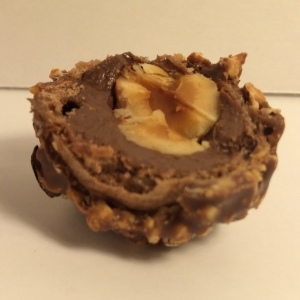 Biting through the top crisp later, into the light airiness of the wafer and the smooooth creaminess of ample ganache before crunching into the hazelnut really makes eating a Rocher a real treat. Not a big surprise Ferrero Rocher was a clear winner with us. 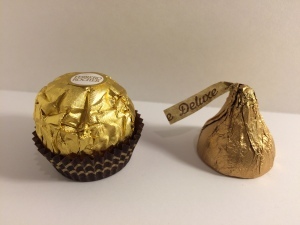 The Kiss “Deluxe” is clearly trying to pull a fast one on Rocher fans with the similar gold foil wrapper but the lack of defined layers, missing wafter and poor quality of chocolate just make for a disappointing experience. If you want a treat, just go for the real thing. 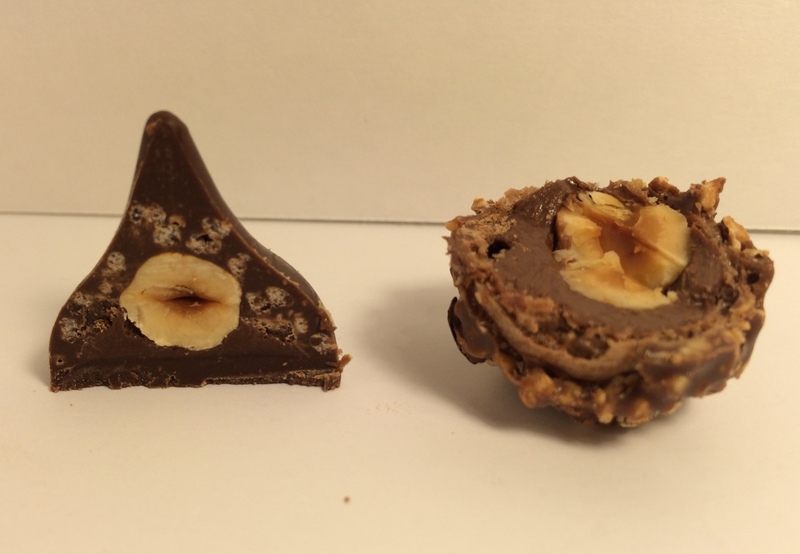 Hershey's Kisses Deluxe or Ferrero Rocher?